The Table component presents information in a table view, sorts data, manages table columns and headers and invokes actions for selected rows. In the example, the data element defines the collection container, which selects Order entities using JPQL query. The table element defines the data container, while columns element defines which entity attributes are used as table columns. rows – a required element if the datasource attribute is used for data binding. columns – a required element defining the set of columns for a table. caption − an optional attribute containing the column caption. If not specified, a localized attribute name will be displayed. captionAsHtml − an optional attribute defining whether HTML tags can be used in the column caption. Default value is false. collapsed − an optional attribute; hides the column by default when set to true. Users can control column’s visibility using the menu available via a button in the top right part of the table when the table’s columnControlVisible attribute is not false. By default, collapsed is false. width − an optional attribute controlling default column width. May contain only numeric values in pixels. align − an optional attribute that sets text alignment of column cells. Possible values: LEFT, RIGHT, CENTER. Default is LEFT. editable − an optional attribute allowing editing of the corresponding column in the table. In order for a column to be editable, the editable attribute of the entire table should be set to true as well. Changing this property at runtime is not supported. sortable − an optional attribute to disable sorting of the column. Takes effect if the whole table has sortable attribute set to true (which is by default). link - if set to true, enables displaying a link to an entity editor in a table column (supported for Web Client only). The link attribute may be set to true for primitive type columns, too; in this case, the main entity editor will be opened. This approach may be used to simplify navigation: the users will be able to open entity editors simply by clicking on some key attributes. linkScreen - contains the identifier of the screen that is opened by clicking the link enabled in the link attribute. linkScreenOpenType - sets the screen opening mode (THIS_TAB, NEW_TAB or DIALOG). linkInvoke - invokes the controller method instead of opening the screen. In this case, the column will display the priority name, but the sorting of the column will be done by the priority order. It can be used instead of providing an implementation of Table.ColumnGenerator to the addGeneratedColumn() method. rowsCount − an optional element adding the RowsCount component for the table; this component enables loading the table data in pages. Page size can be defined by limiting the number of records in the data container using the loader’s setMaxResults() method. Typically, this is performed by a Filter component linked to the table’s data loader. However, if there is no generic filter, this method can be called directly from the screen controller. RowsCount component can also show the total number of records returned by the current query from the container without extracting the records themselves. It invokes com.haulmont.cuba.core.global.DataManager#getCount when user clicks the ? icon, which results in performing a database query with the same conditions as the current query, but using a COUNT(*) aggregate function instead. The number retrieved is displayed instead of the ? icon. actions − an optional element describing the actions, related to the table. In addition to custom arbitrary actions, the element supports the following standard actions, defined in the com.haulmont.cuba.gui.actions.list package: create, edit, remove, refresh, add, exclude, excel. buttonsPanel – an optional element, which adds a ButtonsPanel container to show action buttons above the table. multiselect attribute enables setting multiple selection mode for table rows. If multiselect is true, users can select multiple rows in the table using keyboard or mouse holding Ctrl or Shift keys. By default, multiple selection mode is switched off. sortable attribute enables sorting data in the table. By default, it is set to true. If sorting is allowed, clicking a column header will show a / icon to the right of the column name. 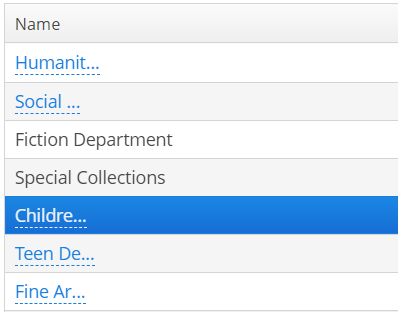 You can disable sorting for a particular column by using its sortable attribute. Table sorting can be performed differently depending on whether all the records can be placed on one page or not. If they can, sorting is performed in memory without database queries. If there is more than one page, sorting is performed in the database by sending a new query with the corresponding ORDER BY condition. In the latter case, the database sorting will be performed by attributes defined in the @NamePattern annotation of the related entity. If the entity has no such annotation, the sorting will be performed in memory only within the current page. If the column refers to a non-persistent entity attribute, the database sorting will be performed by attributes defined in the related() parameter of the @MetaProperty annotation. If no related attributes are specified, the sorting will be performed in memory only within the current page. If the table is connected to a nested property container that contains a collection of related entities, the collection attribute must be of ordered type (List or LinkedHashSet) for table to be sortable. If the attribute is of type Set, the sortable attribute has no effect and the table cannot be sorted by users. presentations attribute controls the mechanism of presentations. By default, the value is false. If the attribute value is true, a corresponding icon is added to the top right corner of the table . The mechanism of presentations is implemented for the Web Client only. If the columnControlVisible attribute is set to false, users cannot hide columns using the drop-down menu of the button in the right part of the table header. Currently displayed columns are marked with checkmarks in the menu. If the reorderingAllowed attribute is set to false, users cannot change columns order by dragging them with a mouse. If the columnHeaderVisible attribute is set to false, the table has no header. If the showSelection attribute is set to false, a current row is not highlighted. contextMenuEnabled attribute enables the context menu. By default this attribute is set to true. The context menu shows table actions (if any) and the System Information item containing information on the selected entity (if the user has cuba.gui.showInfo permission). Setting multiLineCells to true enables multi-line display for cells containing several lines of text. In this mode, the web browser will load all the rows of the current table page at once, instead of lazy-loading the visible part of the table. It is required for proper scrolling in the Web Client. The default value is false. The aggregation element can also contain the strategyClass attribute specifying a class implementing the AggregationStrategy interface (see below the example of setting an aggregation strategy programmatically). The aggregationStyle attribute allows you to specify the location of the aggregation row: TOP or BOTTOM. TOP is used by default. 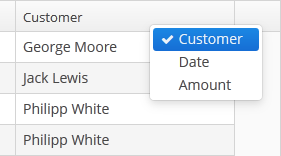 editable attribute enables switching the table to in-place editing mode. In this mode, the columns with editable = true attribute show components to edit the attributes of the corresponding entity. The component type for each editable column is selected automatically based on the type of the corresponding entity attribute. For example, for string and numeric attributes, the application will use TextField, for Date – DateField, for lists – LookupField, for links to other entities – PickerField. For a Date type editable column, you can additionally define dateFormat or resolution attributes similar to the ones described for the DateField. optionsContainer and captionProperty attributes can be additionally defined for an editable column showing a linked entity. If optionsContainer is set, the application will use LookupField instead of PickerField. Custom configuration (including editing) of a cell can be performed using Table.addGeneratedColumn() method – see below. borderless - removes the outer border of the table. compact - reduces the white space inside the table cells. no-header - hides the table column headers. no-horizontal-lines - removes the horizontal divider lines between the table rows. no-stripes - removes the alternating row colors. no-vertical-lines - removes the vertical divider lines between the table columns. small - small font size and reduced the white space inside the table cells. addColumnCollapsedListener() method is useful for tracking the columns visibility with the help of the ColumnCollapsedListener interface implementation. getSelected(), getSingleSelected() return instances of the entities corresponding to the selected rows of the table. A collection can be obtained by invoking getSelected(). If nothing is selected, the application returns an empty set. If multiselect is disabled, it is more convenient to use getSingleSelected() method returning one selected entity or null, if nothing is selected. The origin of the SelectionEvent can be tracked using isUserOriginated() method. addGeneratedColumn() method allows you to define custom representation of data in a column. It takes two parameters: identifier of the column and an implementation of the Table.ColumnGenerator interface. Identifier can match one of the identifiers set for table columns in XML-descriptor – in this case the new column is inserted instead of the one defined in XML. If the identifier does not match any of the columns, a new column is added to the right. generateCell() method of the Table.ColumnGenerator interface is invoked for each row of the table. The method receives an instance of the entity displayed in the corresponding row. generateCell() method should return a visual component which will be displayed in the cell. In the example above, all cells within the color column in the table show the LookupPickerField component. The component should save its value into the color attribute of the entity which instance is displayed in the corresponding row. If you want to display just dynamic text, use special class Table.PlainTextCell instead of the Label component. It will simplify rendering and make the table faster. Consider also using a more declarative approach with the generator XML attribute. scrollTo() method allows you to scroll table to the concrete row. It takes one parameter: an entity instance identifying the row. setCellClickListener() method can save you from adding generated columns with components when you need to draw something in cells and receive notifications when a user clicks inside these cells. The CellClickListener implementation passed to this method receives the selected entity and the column identifier. The cells content will be wrapped in span element with cuba-table-clickable-cell style which can be used to specify the cell representation. setStyleProvider() method enables setting table cell display style. The method accepts an implementation of Table.StyleProvider interface as a parameter. getStyleName() method of this interface is invoked by the table for each row and each cell separately. If the method is invoked for a row, the first parameter contains the entity instance displayed by the row, the second parameter is null. If the method is called for a cell, the second parameter contains the name of the attribute displayed by the cell. // style for column "grade"
getValue() method of the Table.Printable interface should return data to be displayed in the table cell. This is not necessarily a string – the method may return values of other types, for example, numeric data or dates, which will be represented in the XLS file accordingly. If Printable presentation is not defined for a generated column in one way or another, then the column will either show the value of corresponding entity attribute or nothing if there is no associated entity attribute.